Midfielder Flynn Downes has signed a new contract with the Blues which runs to the summer of 2020. 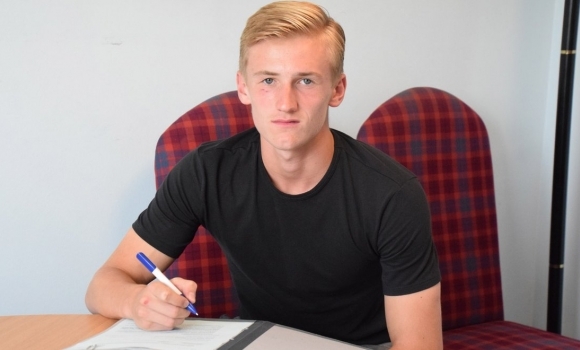 The 18-year-old only put pen to paper on his first pro deal with the club at the end of last month - a one-year contract with an option for a further season - but has greatly impressed manager Mick McCarthy in pre-season. The Brentwood-born academy product began to break into the first-team squad at the end of last season and he was included as a sub for the final game at Nottingham Forest, although without making it on to the field. “All-round, technically he’s a really good footballer, he’s athletic, he puts his foot in, he’ll compete, he’s a real competitor and he’s a winner on the pitch," McCarthy said after the Forest match. Speaking after the 5-0 friendly win at Drogheda recently, he added: "I really do like Flynn Downes, I think he’ll contribute this season." Last night the Town boss described Downes's performance at Peterborough as "excellent". The player himself is targeting involvement in the first team once the season proper gets under way. "I'm really delighted to sign; I've put in a lot of hard work and I feel like it's been rewarded," he told iFollow Ipswich. "It's been a really hard pre-season so far, mentally and physically, but I'm feeling good. "The more senior members of the squad, like Chambo [Luke Chambers] help a lot. They give you a lot of advice but first-team football is a lot quicker. "It's encouraging to see others come through and play for the first-team so it has pushed me on even more because I want to get to that level." Former Blues midfielder Kieron Dyer, recently appointed the club's assistant U16s coach, worked with Downes during his previous stint coaching in the academy and is a big fan. “Flynn, two years ago he was in my U16s, again he had great potential but was a bit behind Andre [Dozzell] and Tristan [Nydam] at the time," he told TWTD at the weekend. “But he’s come on leaps and bounds. In pre-season I hear he’s been absolutely flying, winning all the long distance races, he was ahead on all the running stats and in training in Ireland I heard he was outstanding, which is good for him and he’s another one to look out for." loaned out never to wear the shirt again. A very positive bit of news and the first comment posted has to be negative. So sick of these fools. If you're good enough, you're old enough. Wouldn't it be great to see really young player establish himself in the first team, like Dyer himself did back in the day. Perhaps Downes could be a long term replacement for Skuse? Best of luck Flynn, work hard, keep improving and see where it takes you. Sounds like a long-term replacement for Skuse, hopefully can run teams ragged this season! Great stuff , lovely to see players coming through , ...............just wish we could develop some forwards within the club ! Good luck to you i say! Thought he looked decent at Peterborough last night. Not ready to jump in just yet but definitely worth investing more time in. I really hope that this lad makes it. The trouble is that we all know the McCarthy approach to youth; safety first, caution is good, better to hire an "experienced" player on loan. He'll be out on loan in the next transfer window. Excellent news, he played well last night! Terry Nutkins, you are entitled to you opinion of course. However, last season we had a young right-back called Emmanuel who is talented. He was replaced by a free (Spence) and has now been sent out on loan whilst we sign a Wolves defender on loan as back up to the free. Then there was the treatment of Dozzell; the crowd baying for him, but he wasn't played (did well for England though). Ipswichbusiness we all know the comment about opinions, but Terry was adding facts to back up his opinion. What are adding? Moronic idiots o.k.? Or does Johnno come in for one of your awards. This is fantastic news, especially coming out of the blue as it has. The story indicates that the lad has a high level of fitness which is great to hear, as this will be needed in the first team. However, I can't help feeling that Bishop will have taken a further step down the pecking order if Downes is all they say he is. I hope he proves me wrong, but I just have a feeling Bishop won't make it at this club, despite that massive early promise. Anyway, I don't want to end on a down note, so all the very best to the lad and hope you see you on the pitch in the early weeks of the season. Hopefully a short term replacement for Skuse! Kikapu; on what "facts" was Terry Nutkins relying on? The truth is the way he has treated the likes of Emmanuel and Dozzell. He tends to do well with other clubs' youngsters; e.g. Lawrence. Great to see the "flying" Flynn doing so well. He is really pushing on and looks determined to make it in the first team. Lets hope this group (Dozzell, Downes, Tristan) can really drive each other on & do something wonderful! He could bring real energy to our midfield and could compliment our young midfielders Ward, Huws, Bish, Dozzer. Looks like Hyam will struggle for games this season. Whos........... you called me out, so here I am. Still bitter from them minuses you incurred at the w/e when we last engaged, sometimes in life you have to let it go fella, interesting that on this occasion you have chosen to hide behind good old Johnno for a bit of moral! not a good look fella. Johnno - moronic???? Wtf is that all about, bit drastic ain't it, I like to think I've been around the block a wee bit, but I can honestly say that's a new one to me. Speaks volumes for your character though. Cool dude??? Think not. Peteswindon I know you struggle when it come to getting some of them lovely uppers, but using another posters tongue in cheek post to get some!!! Good work on that one!!! (Desperate??? Lol) that's how your coming across. The sites has changed, that's for sure, anyone daring not to be politically correct, showing humour, negativity or simply being honest are now being hammered by the happy clappy, back slappy everything's cool at ITFC brigade. (Doormats) Short memories?? I have my beliefs and I shall stick to them, entertaining pass and move football is my only agenda, but please be assured here, when the tide turns and the Dino's churning out the same old, I will be very much on hand just to remind you. I like the way that our midfield is shaping. Huws is still young and I think that Adeyemi, Ward and Rowe are only mid 20s. Add to that Andre, Tristan, Flynn and Monty who are younger still and you have a group who could be here for a decade or more and could be a match for anyone in a few years. While many on here do not like MM for his safety first tactics I think that a path forward is clearly discernible. Has Bart got over his bug yet, that's the important thing.